CPR Campaign Updates: NYers Say: Pass the Right To Know Act & Demand #HandsOffTheHomeless! The highly publicized NYPD brutality against Black athletes has brought fresh spotlight to hyper-aggressive policing and use of excessive force by our city's police department. But New Yorkers in communities across the city frequently experience this police abuse without the same response from City Hall and 1 Police Plaza. It's a reason we continue our work to make NYC safer by holding police accountable to all New Yorkers and advancing systemic reforms that can help end abusive and discriminatory policing. We are gaining momentum in our fight and remain undeterred by NYPD media announcements that seek to quell demands for real, lasting reforms rather than deliver substantive changes for our communities. Last week, CPR leaders hit the streets in every borough to engage New Yorkers about the Right To Know Act: legislation intended to protect New Yorkers' fundamental rights against abusive policing that violates their rights. Brooklyn Movement Center hit the streets in Central Brooklyn. Bronx Defenders & Jews for Racial and Economic Justice talked with residents in the Bronx. DRUM - South Asian Organizing Centeryouth leaders mobilized Queens residents. New York Civil Liberties Union pounded the pavement in Manhattan to help New Yorkers voice their support. Make the Road New York members and Staten Island residents lifted their voices for justice to call for the passage of the Right To Know Act at their membership assembly meeting and at a vigil at the site where Eric Garner was killed. 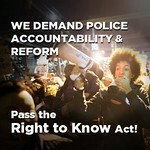 Click here for more photo hightlights from CPR leaders mobilizing support for the Right To Know Act. On Wednesday, leaders from Picture the Homeless (PTH) held a rally with community members, faith leaders and CPR partners and allies to demand an end to the NYPD's targeting and harassment of homeless New Yorkers. The demands were clear: the city must stop criminalizing homeless New Yorkers via the NYPD and instead stay focused on real, productive short and long-term solutions. As PTH member Floyd Parks, who has been targeted by the NYPD, said at the press conference: "I am a human being, and I deserve to be treated with dignity!" We agree and will keep fighting with you for a NYC where all people are treated with dignity and respect! Click here for more photo hightlights from Picture the Homeless rally. There are many ways you can join the growing movement for police accountability and our campaign to change the NYPD. Check out our EVENTS PAGE for a listing of upcoming CPR and CPR member events. Turning out to events is a great way to help build community power and meet others who are passionate about police accountability, safety and justice! The movement for justice would not be possible without your support. Thank you for standing with us to #changetheNYPD.